Our outdoor swimming pool is free for our guests to enjoy as often as they like, between the hours of 9am - 8pm. The perfect spot to relax on a summer’s day, there is a toddler’s paddling pool and shaded areas to escape the heat of the sun. The pool is heated to a tepid temperature from December to the end of January, and is closed in the Winter months. 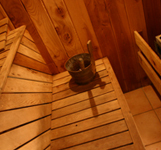 half hour in the sauna, for up to 4 people. Just book a time at the office.